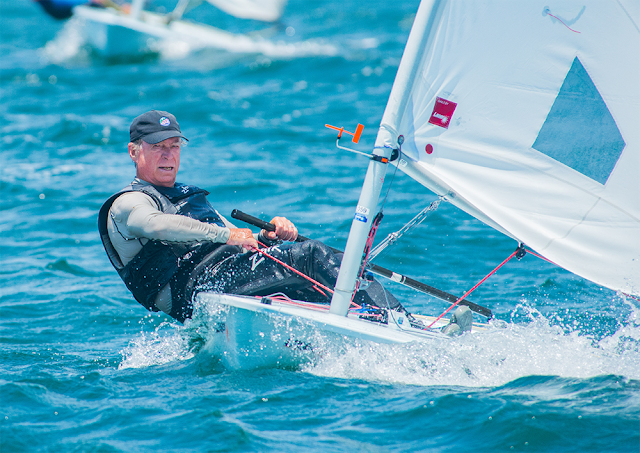 Bill Symes had a great regatta at the recent Laser Master Worlds in Ireland. The International Sailing Academy’s Colin Gowland interviewed with Bill on how we won, as you’ll see below. Colin and the ISA’s Vaughn Harrison are working on a podcast with topics that include going faster in waves upwind, what's it like at the Olympics on the first day, how to break through sticking points/progression barriers, mental game aspects, etc. These guys can help everyone improve so watch for them on Facebook and Instagram. Bill: Hey, Colin. How are you doing? Colin: I’m doing great. How are you? You had a good trip/regatta? Bill: Oh, yeah. Yeah, it was great. The Worlds Regatta was great and then we spent a week touring around. We went to Northern Ireland and stayed at this cool little pub called The Brown Trout. Just did a little bit of rest and recovery for three or four days. And then we came back down to Dublin and spent the last three days in Dublin, just rocking out with the crowds. That place is party central. Colin: That’s phenomenal. I went there on a rugby tour in my youth. Was a great experience on and off the field. Bill: Oh, yeah. It’s a fun town. Colin: Bill, what are you, a great grand master now? Bill: Yeah. I’m half way through my great grand masterhood. 71-years-old, loving every minute of it. Colin: Was it a challenge to keep the body holding together during all that sailing? Bill: Amazingly enough I felt really good throughout the whole thing. It was a really windy regatta. The first three days especially it averaged around 20 with puffs around 30 and very shifty, puffy, challenging conditions. I don’t know why but I felt really good. My energy level was high, my strength held up, and I just put it down to the fact that I trained more than 20 days in the gorge this summer, a lot of it was with Andrew Holdsworth. He moved to Seattle in August so he was coming down here every weekend and we were sailing two or three days out in the Gorge in almost the exact same condition that we had in Dublin. He’s younger, very fit and very fast in a breeze. (Andrew finished 4th in the Radial Masters Division at Worlds) It was windy, shifty, puffy. The sea state was very similar, big, short, chop. I think that by the end of August I had a pretty good comfort level in those conditions. Colin: What was your game plan? Did you have a speed advantage out there? It looked like you had some pretty dominant results. To me, just looking at that score card that’s what I would think right away. Did you feel like you had an advantage in boat speed? Or did you have the strategy wired? Or did you just sail consistently? What was your secret to success or was it a mix of everything? Bill: I did have a bit of a boat speed advantage. You know what they say about how boat speed makes you look smart. It made it easy for me to execute everything I needed to do. I was always able to get off the line clear. I was usually able to get on to the lifted tack right away and that was my game plan. It was basically to try and get clear starts, get onto the right tack, and then just cover the fleet. In most races that’s what happened. I was able to kind of jump out if not into the lead at least into the first group and stay there to the weather mark. I had a pretty big speed advantage down wind so if I wasn’t first at the weather mark I was usually first at the leeward mark. I think that, especially in the Great Grandmasters fleet, the top guys are pretty fast but a lot of guys are just in survival mode. I mean, it was blowing pretty hard and the downwinds were pretty crazy, but I was used to that from my training in the Gorge. I mean, that’s the conditions we sail in so I felt very comfortable. I was still racing, doing my turns and going for more and more speed downwind. I think that made a lot of difference. Colin: You live in Portland so your home venue really is the Gorge. That’s got to be a massive advantage given all the training you did this summer… and over past years. Bill: It certainly was for this venue because the conditions in Dublin turned out to be very, very similar to what I sail in here. Colin: Usually when you look at successful sailors in big breeze, they are typically either the biggest or the fittest or both. You don’t do much traditional fitness outside of sailing, right? You just go sail in big breeze and that’s sort of your formula? Bill: Pretty much. I’m not real big on going to the gym or doing any kind of fitness specific exercise. I’ll ride the bike as much as I can, try to work on some aerobic fitness, but mostly I just sail. Colin: Right. Do you put together sort of an annual plan about how your sailings going to go for the whole year with the World’s as a goal, or is it just something you start thinking about a few months before? Colin: 80 days, how did you come up with that number? Bill: That’s just a rule of thumb that I’ve developed over the years that if I can sail that much especially in challenging conditions I will definitely… well maybe not definitely… but I will generally have reached the level of hiking fitness and sailing confidence that I need going into Worlds. I mean, it’s worked for me over the last few years and so that’s kind of the recipe I follow. Colin: Yeah. And then, you said you did some training in the spring. What about November, December, January, and February? Bill: I don’t do much. Between now and the new year I probably won’t sail too much. Maybe here in Portland. We have a Sunday race with our local fleet, Sunday series. I’ll do that stuff just for fun but I won’t do any serious training until spring. That usually starts with March or April in Mexico. Colin: It’s interesting. I mean, I think since probably you were young you’ve probably been getting good results in sailing but my observation over the last four years, is that you’re still getting better. I don’t know if you feel like you are or not. You mentioned in a past interview that the learning is something that keeps you coming back and having fun with it. Can you just speak to that and if you feel like you’re still making progress at 71 years old, knowing all that you know already? Bill: Definitely. I think I’m sailing better now than I probably have in my life. Of course, the problem you have as you get older, is it’s like walking up the down escalator. You have to run faster and faster just to stay even. Yeah, I just wish I had known what I know now back when I had the body of a 20-year-old. Aside from just being competitive, I find it enjoyable again because I am making gains in my sailing speed, especially downwind. I think in the last couple of years the coaching that I’ve gotten from Vaughn and from Brett and yourself has just made a huge difference in the way I sail downwind, and I’ve practiced those techniques a lot – I’ve spent a lot of time in the Gorge just working on that. It has definitely made a difference. Plus it’s fun. it’s made Laser sailing more fun because I’m more comfortable in the boat in more conditions and I just really enjoy sailing it that way. Colin: You’ve been around the Master’s fleets at your home club and internationally and seen a lot of guys train down here. If you were their coach and they were the average master sailor, let’s just say, what kind of advice would you give them in terms of should they do to be successful? Replicate more or less your plan like training 80 days at minimum? How should they do go about it? Do they identify weaknesses, they get coaching, do they just go race? What do you think is the best strategy for them? Bill: I don’t really know any other way to do it than the way I do it, and so I would recommend that. The base of my program is lots of sailing; not just sailing, but training in good breeze and just logging the hours. I don’t race that much. I used to try and hit all the big regattas, I don’t do that anymore. This year I just hit a couple. I did a couple of winter regattas down in California, I did the Master’s North Americans in San Francisco and I did the Laser PCC’s in the gorge and just a couple of other local regattas in the Northwest. I don’t travel that much, not as much as I used to. Bill: This is not to say that it isn’t important to sail in big competitions, because it is. But I don’t think that has helped me as much as just the training I do with a couple of fast training partners. I’ve been lucky to have Andrew living in Seattle now, and also Rob Hodson and Dave Jursik, a couple of other local guys who were also training for Worlds in the Gorge. We just go out and beat each other up out there and that has, I think, helped me more than traveling around to all the big regattas. You know, you’ll find a lot of guys that take sort of the opposite track and try to hit all the big regattas. I’m sure there’s a lot of value to that, especially for improving starting skills, because that’s the only way to really practice starting. Bill: But you know, I think I’m a pretty strong starter anyway. I don’t feel like that’s a huge weakness, but certainly going to the big regattas helps that part of your game. Bill: I mostly focus, my focus the last few years has just been on boat speed. I figure if I’m confident in my boat speed, that pretty much takes care of all the other issues. Colin: Right, yeah. Yeah, it is a race after all. Colin: I guess when you say, maybe you don’t do so many regattas, but you do training, and you said focusing on boat speed with good training partners, but, what do you do? What do you guys … When you go out to train let’s say, what do you do out there? Bill: We do focus drills, kind of like you do at ISA. We will do lineups, upwind lineups. This summer, Andrew and I did a lot of reaching because we both felt that was an area we needed to strengthen. We did a lot of heavy air reaching, and I definitely improved in that area as a result. We worked on trim and sail controls. We practiced different vang tensions, different downhaul and outhaul tensions, different trims, different ways of steering through the waves. Colin: Yea that deliberate practice is something we really promote here. What else? Bill: We just banged away at it. We’d reach across the river, we’d stop, and regroup, and reach across the river again. We’d do this nine or ten times in a practice. Like I say, we do the upwind lineups, we do short racing, we do lots of long downwinds. We do like five mile downwinds going through the different wave conditions in the Gorge. You’ve got short mostly flat water at the top of the run, and then as you get down – actually upriver, but downwind – you get into much bigger, almost oceanic waves. We had a range of conditions, a range of wind speeds. The training went up and down, and up and down. We did a little bit of starting practice, focusing on acceleration and holding a lane, we pretty much try to practice all the fundamentals. Colin: Yeah, it sounds like pretty productive session. I think what a lot of guys tend to do is go out once every couple weeks in the spring/summer/fall, probably that’s being generous, and then they go out and just race on Sunday, and do six, seven races, whatever it is, and come back in. You look at those fleets, and who’s at the top, and who’s at the bottom, and who’s in the middle, and it’s very rare to see much of a mix up over a period of years with that kind of approach. I think this is because mostly everyone is sailing the exact same way they have in the past focusing on “strategy/tactics” when there is still so much boatspeed and boathandling available for them to learn. Bill: Yeah, I think you nailed it with that analysis. It’s common to see that mentality in Laser fleets. Colin: I understand you have a new winter residence now? Colin: That’s great. Why did you decide to set that up? Bill: Well, as you know, we’ve been coming down there for the last three or four years and training at ISA. I just find the clinics enormously helpful and enormously fun. My wife, Laura-Lee, has fallen in love with the town of La Cruz. It’s just a nice environment. It’s a beautiful site, right on the north shore of Banderas Bay. I don’t know, we’ve always sort of had it in the back of our mind, that it would be nice to have a winter getaway spot, because in Portland, Oregon in January and February can be pretty bleak. That just seemed like the perfect spot. It’s warm, it’s beautiful, it’s close to great Laser sailing. The quality of the sailing is fantastic. It’s affordable. It’s certainly easier to buy a beach front residence in La Cruz than it is in Oregon or California. Colin: No kidding. We’re really happy that you made that decision and that we’ll get to see more of you down here, and do a bunch more training together and whatnot. It’s really awesome, congratulations. I’d expect to see more dedicated sailors making similar investments as the years go on. Bill: Yeah, we’re looking forward to it. Colin: How many clinics did you sail last year at ISA to prep for Worlds? Bill: I think I did two in Mexico. Bill: And one in the Gorge, or most of one in the Gorge. I also had that little half session in the summer with you and Jonathan Sherretz. Bill: Which, you know, it was a really good year for me in terms of sailing in Mexico. We just had a lot of opportunity to get down there and conditions were great. Even the last one in June we had good conditions. Colin: That was nice, people don’t know necessarily that our wind can stay really nice here all the way through July. Bill: That was great. I really look forward to more of that in the future. Colin: What do you think beyond what you do just training on your own, what do you think what is the value in the clinics that you attend here? 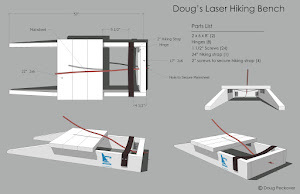 Bill: I think it has pushed me to think about Laser sailing in new ways, think about Laser sailing in new ways. You know, it’s hard to teach an old dog new tricks, and I’ve been doing this off and on since the ’70s. It’s (attending clinics) forced me to take a much deeper dive into how to sail a Laser, and what are the factors that you need to be considering to make it go faster. I learned a lot from Vaughn, who really sort of brought home how important apparent wind is. 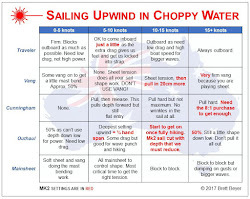 I always, I think most competitive sailors understand apparent wind, and think about it when they’re sailing, but he has really helped me understand how important it is, and how you can use it in the way you think about sail trim, and angle, and all that. Bill: I think that was a big breakthrough for me. And clearly the downwind stuff, Vaughn’s technique varies a little bit from Brett Beyers, but I think both of them have helped me to develop a better understanding of how to sail the boat downwind. Vaughn’s emphasis on creating the energy through turning, and Brett’s just a little more nuanced I think, just pressuring up the rig, and then using that pressure to take it down to the wave angle. Those are techniques that have really changed my whole sailing style, and in many ways forced me to break the old mold and learn a new one. Colin: Yeah it’s nice to have different coaches giving perspectives on technique. You mentioned the conditions here which are obviously a nice thing. What about the other people training and sort of a camaraderie of it? Do you enjoy that part, or are you more just down to put your nose to the grindstone and get your training in? What’s your perspective on that aspect? Bill: Definitely I value the friendships and the relationships that I get through Laser sailing. Really, that’s what keeps me coming back to Laser Master Worlds, more than anything, is just that I’ve gotten to be so close to that group of guys that I would hate to miss it. It’s like our annual party. Most of these guys I only see once a year, and this is our opportunity to get together, socialize, eat and drink together, and just have a great time. It’s wonderful. Colin: It seems like those friendships, really, they go pretty deep. 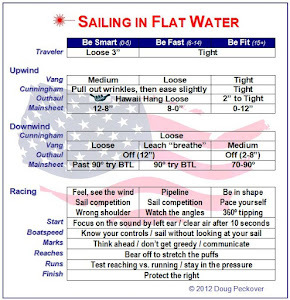 It seems like a really important aspect particularly in Master sailing, but you see it in all types of sailing. which is a little different than it was when we were sailing in the open fleet – there wasn’t so much of that aprés sailing fun going on. Colin: Aprés sailing fun you say. Any funny anecdotes from the worlds? Anything notable that happened that you wish to tell? Bill: Funny, tragic maybe. In the third race and the 10th race, I don’t see very well and when I’m sailing in those conditions I can’t wear glasses, because it they get too messed up with the spray. So I have trouble seeing the marks. In the 4th race, I had a pretty good lead coming around the leeward mark, and going up to the second weather mark, I couldn’t find it. I sailed a little far off to the left, and the next thing you know I rounding a mark, but it turned out I was on the outer loop of the trapezoid course when I was supposed to be on the inner loop. Bill: Weather mark when I should have been going to the inner. I turned a first into a 29th in that race. I thought, “Oh, okay, I’ve burned my throw out, I’ve made my big mistake, I won’t make that mistake again.” Then in the 10th race, I had another situation where I was leading after the second beat, I took off on a screaming, fire-hose-in-the-face reach, but again I couldn’t see the marks, didn’t know where I was going, and wound up heading for the leeward mark instead of the reach mark. By the time I got back in the boat race, I was 20th(which I had to keep in my score). With two more races to go, I was pretty sure I’d snatched defeat from the jaws of victory. That was not a happy night. This is what happens when you get old and feeble. Your faculties start deserting you. Boat speed was great, but the brain power was a little bit impaired. Colin: I’m not sure what kind of training we can do for that one Bill. Maybe some compass work! I wonder if it was too much Guinness the night before? Any wild antics from the streets of Dublin, or are those all sworn to secrecy? Bill: Well, some of that’s classified, but all I can say is a very good time was had by all. We usually gather together in informal mobs and go out on the town and eat and drink until the wee hours. We did not skimp on the social side of things. It was a lot of fun. Colin: Sounds like these masters sailors know how to do it right! It’s a great community, and we’re always happy to have our masters sailors training hard and having fun here at ISA too. All right Bill, thanks for taking the time. I think we covered some good ground here. I look forward to seeing you soon down in Mexico for some training and relaxing in the near future! Bill: Yeah, thanks Colin, we’ll see you soon.